Our country at this time needs a new group of elites consisting of professionals in the military who will join in building a new nation built on high values of integrity, justice and diligence, according to President Muhammadu Buhari. “This nation needs an elite prepared to stick together, fight corruption and other national ills side by side. An elite who insists on justice even where our friends are at the receiving end,” the President concluded. “Our society is more complex and our world is more difficult than ever before. The nature of warfare is also vastly different, consequently the officer of today cannot just be soldier, in any event, being in the military today requires more than just carrying weapons. The officer must be a public intellectual of sorts, a thinker, versatile, dynamic and capable of introspection”. He told the gathering, which included the Governor of Kaduna State, Mallam Nasir El-Rufai, the Minister of Defence, Mansur Dan-Ali, Service Chiefs and other senior military officers, that contemporary military warfare especially the influence of technology like drones has thrown up a huge challenge for the military who must develop the right strategies to deal with what he described as “this future before us”. 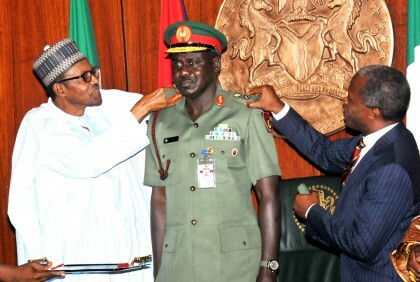 The President then commended the management of the college for pursuing appropriate structured courses for the participants to prepare them for command and staff responsibilities in full scale warfare, noting that the graduation ceremony “is a testimony of your hard work and determination to contribute towards the re-professionalization of the Nigerian Armed Forces”. He stated further that by the nature of the unconventional operations of insurgents, there is the demand for appropriate strategies from the military to combat it. 191 Nigerian officers from the military, paramilitary and civilians including 8 foreign military officers from the African continent, and a South Korean officer graduated from the prestigious military institution.